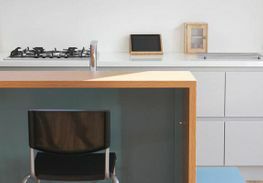 Noctor Furniture is a specialist kitchen designer, manufacturing and fitting company. By using only the very finest materials, we produce beautiful bespoke, handcrafted kitchens. We combine our passion for Irish craftsmanship with quality materials and world-class customer service, to create truly special kitchens that become the centrepiece of a client's home. With an ethos that prioritises quality and integrated client collaboration, our kitchens are designed and created using a combination of our unparalleled expertise, the specifications of the property and the client’s own unique sense of interior design. Our bespoke kitchens are a unique fusion of practicality and elegance that seamlessly blend modern design with traditional craftsmanship. For more information on our range of professional services, get in contact with Noctor Furniture today. Our principal master carpenter is Stewart Noctor. As a fully qualified Cabinet maker with over 2 decades of industry experience, he has built Noctor Furniture around his passion for quality materials and bespoke Irish craftsmanship. Our sleek, handcrafted contemporary kitchens don’t compromise on elegance or on practically. By concentrating on form and on function, we create rich and inviting bespoke kitchen spaces for the whole family. Our beautiful in-frame kitchens add a contemporary twist to traditional designs. By taking cues from some of the 20th century’s most enduring interior design trends we create an irresistible modern kitchen that combines old world elegance with contemporary kitchen conveniences. 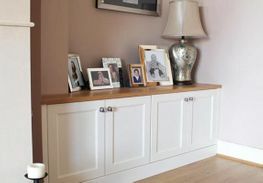 With over two decades of bespoke living room cabinet design experience, our team of master craftsmen create beautiful and practical cabinets for sitting rooms. Our innovative storage solutions are designed to maximise the potential of the available space.
" From initial planning through to the final polish, Stewart was professional and patient. He is committed to the highest standards - we are delighted with the quality of his work. " 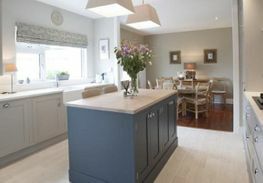 " The kitchen is fabulous and we love it. It has surpassed our expectations in terms of quality - you can see the attention to detail in every aspect of it. " " Stewart completed our bedrooms with built-in wardrobes and also built a bookcase and writing desk. We have found him to be an excellent cabinet maker, very reliable and professional. " " All Stewart’s work was done to my satisfaction anyone who saw it almost always asked who did it. I would have no hesitation in recommending Stewart to anyone. He is meticulous in all his work. " " Stuart is a dependable, honest and talented cabinet maker. As importantly as all this, his price was competitive.Four years later my kitchen still gets compliments from visitors! " " I could not recommend Stewart enough, he is always pleasant to deal with, listens to all our suggestions and adds his own. Not to mention that his prices are always very reasonable and competitive. " " Stewart’s help designing the kitchen, his patience, skill & workmanship leave me without any hesitation in recommending him to others. I love my kitchen! " " First class service. Your professionalism throughout every project you work on for us. Nothing is ever a problem. You are always a pleasure to deal with. " 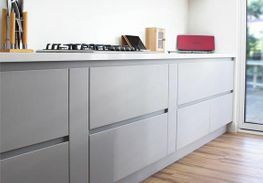 Noctor Furniture offers a wide range of custom made furniture products such as fitted kitchens, bedroom furniture, free standing and fitted furniture in a large range of colours and designs made to meet your specific needs.